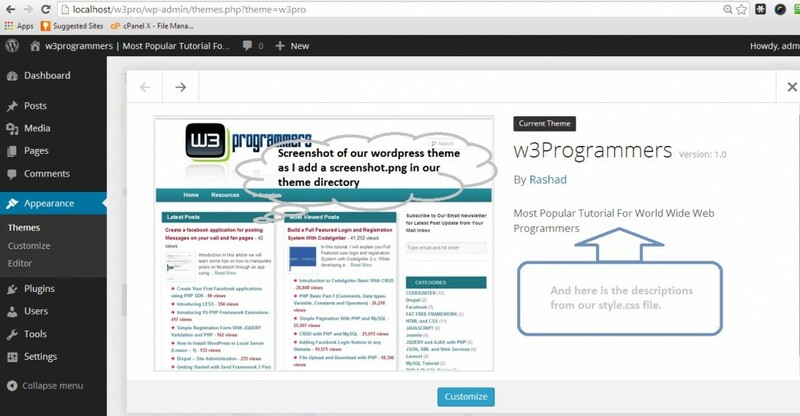 In the below image shows the wordpress website basic structure. 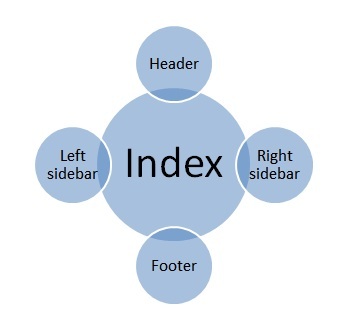 Now I am going to hook wordpress header, footer and sidebar part in our index.php by the below code. //Here will be the code of wordpress looopp to displaying! Now back to our header.php file and today we are going to build the header part of w3Programmers theme. Still now, there ( http://localhost/w3pro/ ) is nothing in our web browser. As I am doing here a dyanimic wordpress website, First I use to clear DOCTYPE by <!DOCTYPE html> with html5. Some of the code are going to be footer, please don’t get confused to look the header code. After clear the DOCTYPE I started the html tag with a language type “en”. You an use your own language in the html tag. In html tag, I use head tag. In the head tag, I use two php function wp_title() and bloginfo() to get the wordpress title. After the title tag and inside the head tag, I link our style sheet. Finally, I code a wordpress hook call wp_head() to get the header information of our website. Okay! In this wordpress tutorial, we learn how wordpress function work to get a full dynamic information in header. In the coming tutorial, I will describe to set the logo and navigation of the wordpress header section. Trank You! Здравствуйте! Note the list of Tags used to describe the theme. These allow user to find your theme using the tag filter. You can find a full list in the Theme Review Handbook .